Very popular in Chinese cuisine for making stews and rice dishes, Clay Pot dishes are sometimes labeled as “hot pot” or “hotpot” dishes on the menus of Chinese restaurants. Our Clay Pots are manufactured and imported directly from China and made from the finest clays therefore are able to be used on an electric or gas stoves. The exterior is untreated with a sandy finish, while in interior has a dark smooth glaze. The Clay Pot is very durable however clay is a natural material that requires a little more TLC to ensure long use. Before using the pot for the first time, wash the Clay Pot with mild soap and completely submerge and soak the clay pot and lid overnight. You should also seasoned the Pot before the first use by making a simple porridge by filling the pot ¾ to the top with water then adding cooked rice to bring the level to the glazed portion and cook over low heat with the lid on for about 10 minutes. Slowly increase the heat to a medium-low and cook for another 15 minutes, or until the liquid begins to simmer. Remove the lid and bring down the heat, continuing to simmering over low heat without the lid until the liquid turns into a porridge (or a paste). Turn off the heat and let the porridge cool and rest with the clay pot for an hour. Discard the porridge, rinse the pot with water and let dry upside down tilted at an angle so that air can circulate through the cavities. This seasoning process fills in the microscopic holes or any hairline cracks in the pot. As with all Clay Pots, avoid sudden temperature change to avoid cracking. A Clay Pot should not be put in a dishwasher but rather hand washed with mild soap. For stubborn particles, you can use some baking soda as a scouring agent. 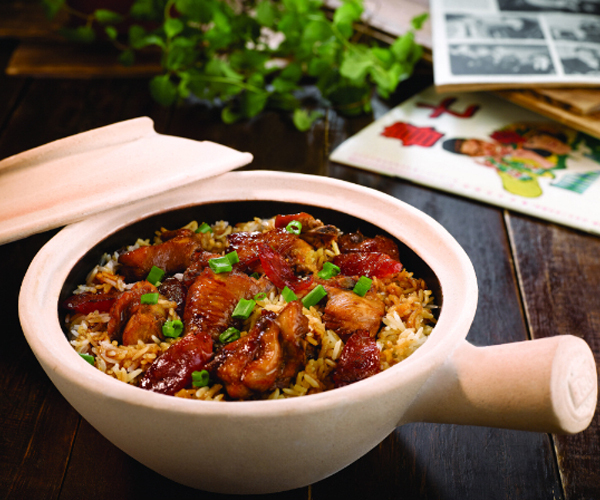 Claypot chicken rice can either be served as dinner or lunch, and a very common dish in Malayisa. The rice is cooked in the claypot first, with the rest of the ingredients added later, making it a great one-pot dish.